Fortress-walled Saint Catherine's monastery on the Sinai peninsula has been a pilgrimage site since its founding by the Byzantine Emperor Justinian in the 6th century. According to tradition, the monastery sits at the base of the mountain where Moses received the Tablets of the Law. Set in rugged country, accessible in times past only by a many days journey by camel across barren desert, the monastery survived intact through the centuries, and, as a result, became a rich repository of religious history—told through its icons, mosaics, and the books and manuscripts in the monastery library. 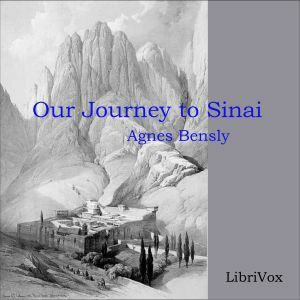 Our Journey to Sinai by Agnes Bensly is the story of a visit to Saint Catherine's by a group of British scholars in the 1890's, who were drawn there in quest of manuscripts from early Christian times. The group had one particular prize in their sights. It was a second century translation of the Gospels from Greek into an Aramaic dialect called Syriac. This was a rare find indeed. One of the group, Agnes Smith Lewis, an accomplished linguist, had been to the monastery once before. On that visit, she had spotted a “palimpsest of most venerable appearance,” a palimpsest being a parchment (leather) paged book, which had been used to write on at two different times, the first set of writing having been partially scraped off the parchment before it was reused. Agnes Smith Lewis had recognized the hidden underwriting in this book to be in Syriac, “the native language of Our Lord and His disciples.” And now, the excited group had decided to revisit Saint Catherine's, in hopes of copying and reading the ancient text. Their trip is vividly described by Agnes Bensly --bustling Cairo; a tent and camel crossing of the desert with Bedouin guides; the monks and monastery life; a breathtaking climb up 3000 stone steps to the top of Mount Sinai, and what they found in the mysterious manuscript they had come so far to see.